Go to the 3100 block of W. 36th Place – between Kedzie and Albany – and you’ll find a display of public art unlike any other in the city. 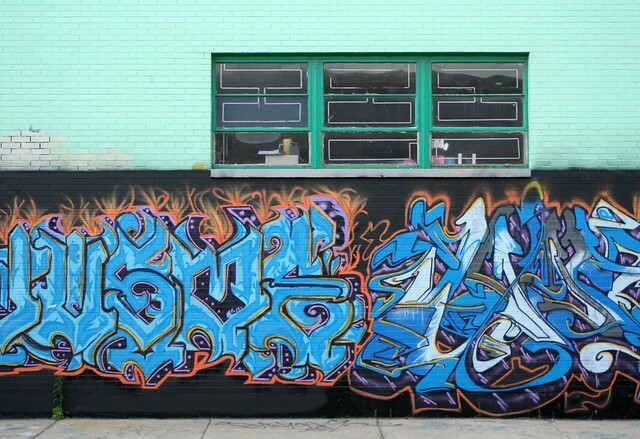 This elaborately detailed, fantastically complex composition is one of dozens – perhaps hundreds or thousands – that, over the last decade, have graced Chicago’s Aerosoul Walls – home of Chicago’s biggest and best collection of graffiti art. 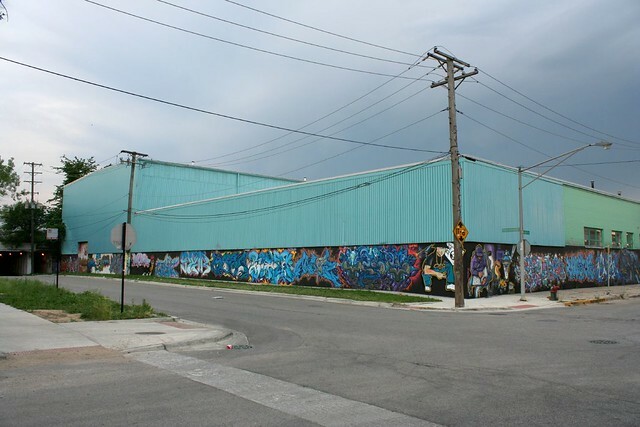 Standing at the corner of 36th Place and Albany – a dreary industrial zone south of the Ship & Sanitary Canal – the otherwise undistinguished Crawford Steel Building is Ground Zero for the Chicago graffiti community. 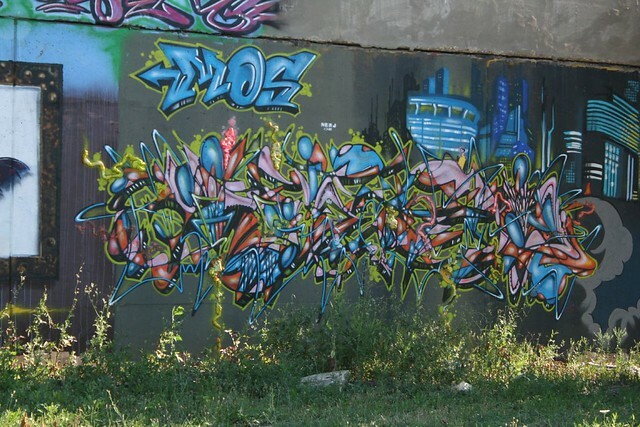 Here, aspiring and prominent taggers practice their art, devising and executing larger-than-life works in the open air. The display is ever-changing; new works are constantly underway, layered over the old. Quite a few works had vanished between my first visit, in May, and my second, in early July. Photos posted a few years ago on local discussion boards show works that have all since vanished. 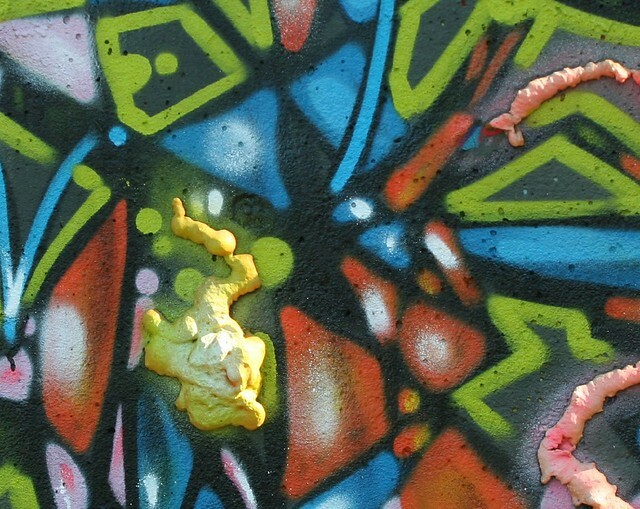 Each wall is “owned” by a group of particular artists, whose works are not to be painted over; violators will find their own work quickly painted over. 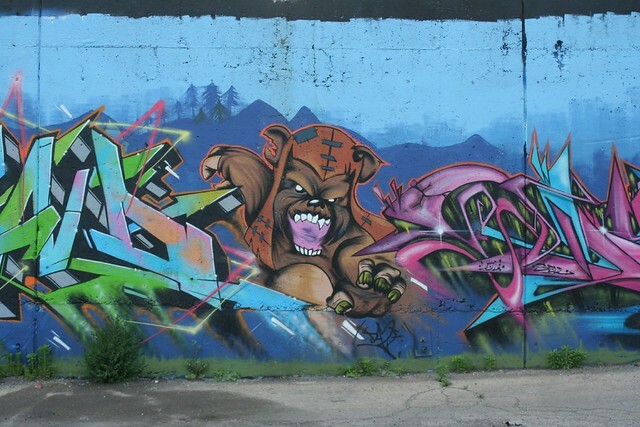 …and a rabid Ewok from Return of the Jedi nearby in the same composition. 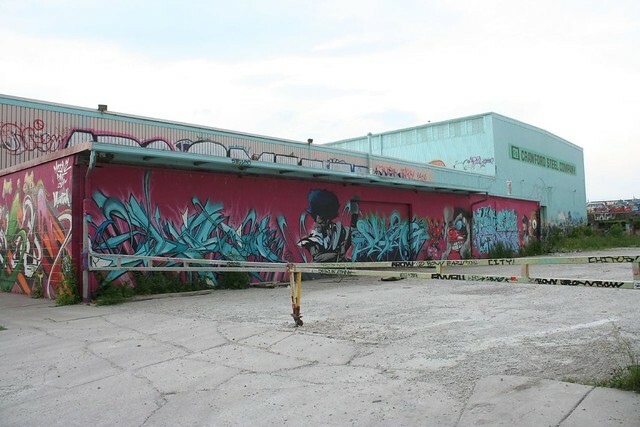 The influence of the Aerosoul Walls extends well beyond the Crawford Steel property. 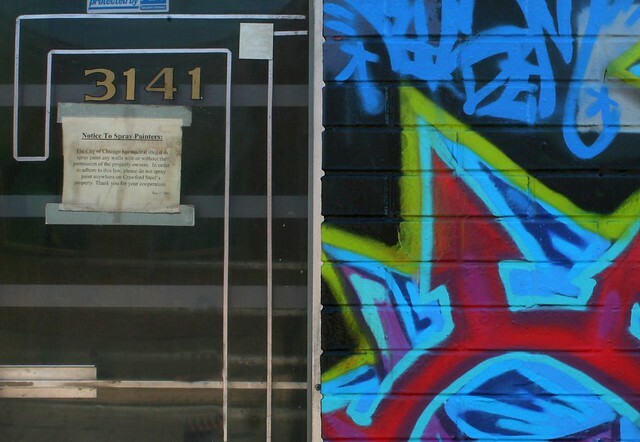 One rule of thumb about graffiti artists – they have no interest in staying inside the lines. 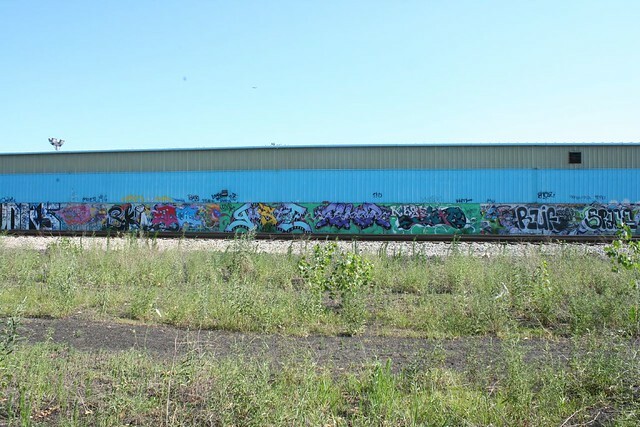 Give them an officially designated canvas and they will inevitably fill it up and move beyond it, as St. Louis learned when it invited taggers to decorate its industrial floodwalls some years back, and got tags on vacant historic buildings downtown. So it is here – except that instead of damaging historic architecture, here taggers have bombed a group of run-of-the-mill industrial buildings. Several anonymous buildings on the same block, facing the emptiness of the railroad tracks, are heavily slathered with layers of tags. 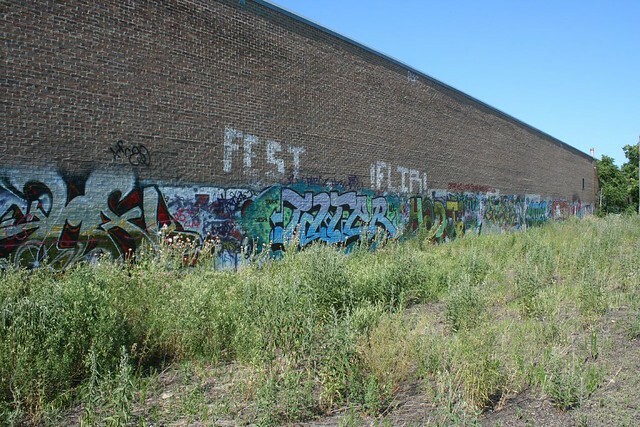 These solid walls of graffiti are highly visible from passing Amtrak trains, which is how I first became aware of the place. These more obscure locations tend to invite works of lower quality, as well as somewhat diminished respect for the better paintings that are done there. A piece may last for several years, or only a few months or weeks. Technical craftsmanship and artistic originality are no guarantee of survival, though they sometimes help. More useful is getting your tag into a spot that’s harder to reach – above the nine-foot reach of the typical tagger, for example. 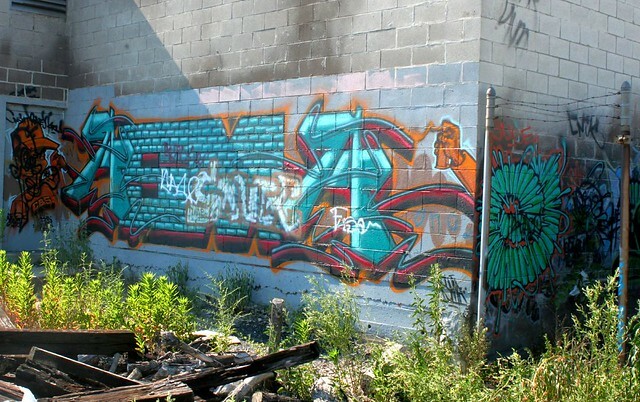 There are elements of gang activity to some of the tags – though most gang tags lack the artistic quality of dedicated taggers’ work. But I can’t say it really bothers me much. Truthfully, about the worst outcome I can see here is that this area acts as a prepping ground for writers to tag other walls elsewhere, with perhaps less harmless results. I have seen works of far lesser craft and quality enshrined in museums. The Crawford Steel building looks much better with its ever-shifting array of artworks than it would without them. The adjacent buildings cannot be said to have any artistic merit – why shouldn’t they be used as a giant canvas? 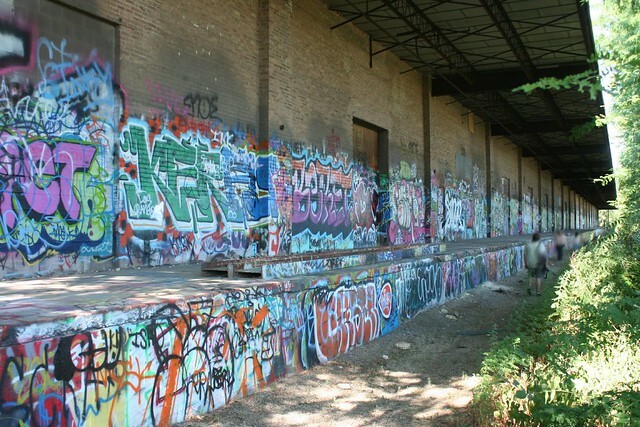 In my opinion, the city should have places like this – designated tagging grounds, places where artists can express themselves and stretch their creativity unencumbered. In this depressingly drab industrial section of town, it is a breath of fresh air and one of the few sources of beauty. For good or ill, the graffiti valley on either side of the railroad tracks represents an outpouring of the community’s voice – a chorus of souls striving to be heard. Perhaps I’m putting a benign spin on a malevolent force – but in the aggregate, I find this collection of tags to be overpoweringly wonderful. 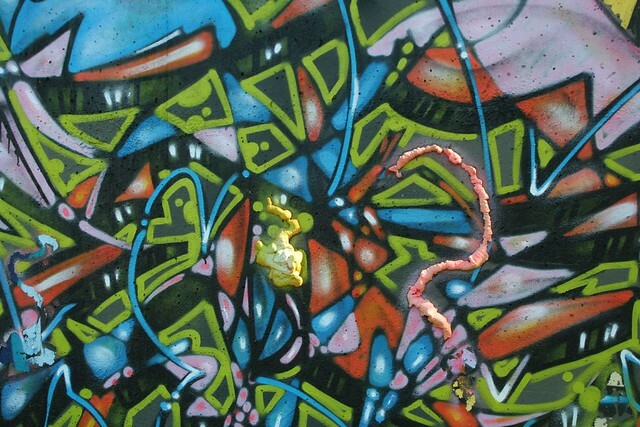 This entry was posted in Life in Chicago, modern folk art, Murals, Wall Art and Graffiti. Bookmark the permalink. Great post. I really love your blog, keep it up! I am a Chicago native, and sadly, when you live here, it’s hard to see everything with such fresh eyes. I loved your Peterson Ave. piece as well. I am moving to Grand Rapids Michigan, home of Victorian apartments and working class dive bars, and I hope I can appreciate it’s diverse structural charms the way you have the city of big shoulders. 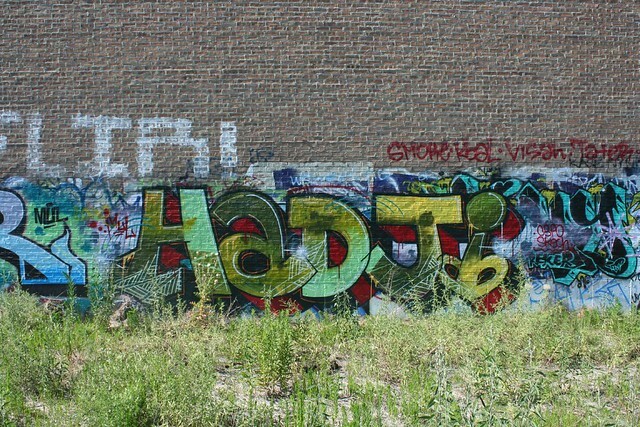 I must confess and say that in the early 90’s I was a graffiti writer in Chicago. During the early Clinton years, hip hop culture was very popular in the city, and when I was in high school, tagging and writing graffiti was quite a trend. I had always loved art as a student, but public education lacked an outlet for my creative energy, so I naturally took to the genre. 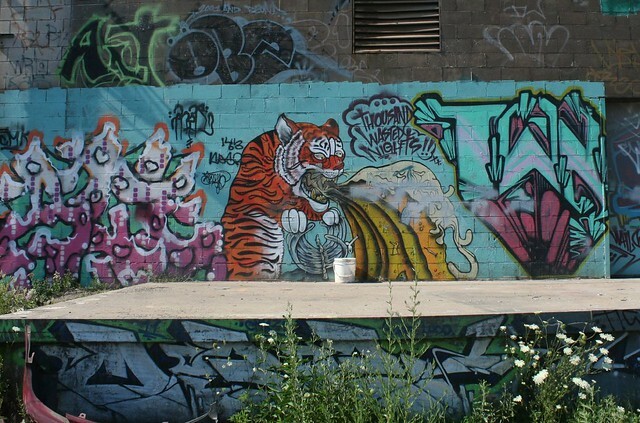 I fell in love with the book Spraycan Art by Henry Chalfant and James Prigoff. I remember taking the L train down to a bookstore on Wabash and buying the last copy off the shelf. It felt like I had found the holy grail. I love everything about graffiti: the black bound sketch books, the smell of spray paint, the spray paint caps, the homemade markers, the writers meetings in the parks to compare sketches, and of course the late nights out with two or three friends making things people would marvel at. There really is no malice in graffiti. I mean, some of the best writers were rough dudes, and might have some gang affiliation, but graffiti was always about the culture first and everything else second. I still have a love for it, so I was happy to read your piece. If I was not 36, I’d be out tonight on a rooftop making marks someone might see on the train on the way to work. Keep discovering the city and writing about it!